The containment dam near Grace, Idaho where Cross Marine Projects was tasked with boring a large diameter hole through the dam while it was filled with water. 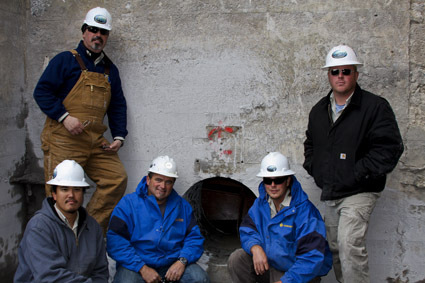 Cross Marine team members inspect the hole the company bored through the dam at Grace, Idaho in April, 2011. The hole came out within one-quarter of an inch of its predicted breakthrough point on the water side of the dam. 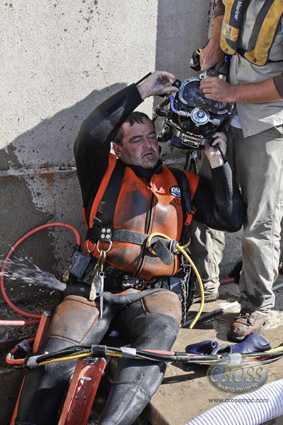 Commercial diver Aaron Rasmussen emerges from the inner portion of the dam at Grace, Idaho where he has been using specialized vacuuming equipment to remove tons of silt that had piled up over several decades, April, 2011. Rasmussen is wearing a dive suit designed for cold water diving that circulates warm water over the diver’s body to allow him to work in extreme environments. Cross Marine diver Alan Cody descends into the dark water under the dam at Grace, Idaho, April 2011. Cross divers are trained to work in zero-visibility conditions to perform heavy construction work underwater. 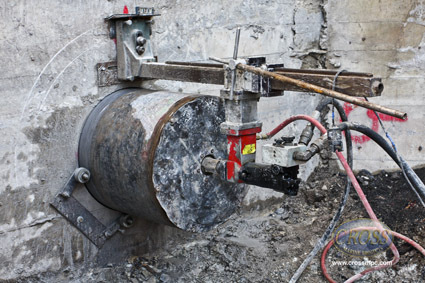 Hole cutting machine used by Cross Marine Projects to cut a twenty-four inch diameter hole through the base of the dam at Grace, Idaho, April, 2011. Cross Marine Projects crew members pose by the hole they worked together to cut through the base of the dam at Grace, Idaho, April 2011. Using this method of boring through a working dam filled with water is believed to be a first. Cross Marine Projects recently completed engineering work on the containment dam near Grace, Idaho which will allow the dam to transport irrigation water almost twenty miles without using fuel-powered pumps. 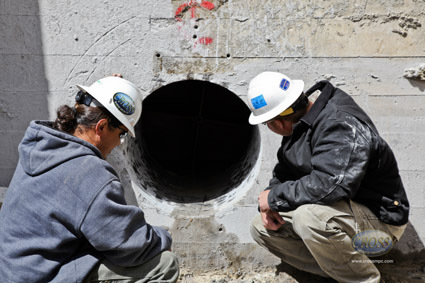 Using an original design and innovative construction techniques, Cross Marine cut a hole through the base of the dam and installed piping that uses the dam’s water pressure to move water to agricultural sites. Under a contract with PacifiCorp, which operates the Grace Dam, in March, Cross Marine divers went under ice at the surface of the reservoir, cleaned out layers of silt that had accumulated over several decades, and installed a custom-designed barrier that allowed a core-drilling crew on the downstream side of the dam to cut a two-foot diameter hole through to the water side. Cross Marine’s special barrier prevented the enormous water pressure inside the dam from causing a destructive and potentially deadly water explosion. The operation was completed in April and the special barrier was removed shortly thereafter. The Grace Dam, built in the nineteen-twenties, was originally designed as a containment dam to prevent flooding during the annual spring runoff. Excess water was essentially “wasted,” flowing over a spillway without being made available for any constructive purpose. With the addition of Cross Marine’s retrofit, however, the Grace Dam can now access the potential energy of its stored water to transport irrigation water without using expensive and environmentally damaging pumps. In the Twenty-first Century, economic and environmental concerns make construction of new dams prohibitive. However, innovative engineering, like what Cross Marine Projects just installed on the Grace Dam, can give new life to existing dams in ways the original designers never envisioned. The precess can also mitigate environmental problems such as silt buildup in aging dams. 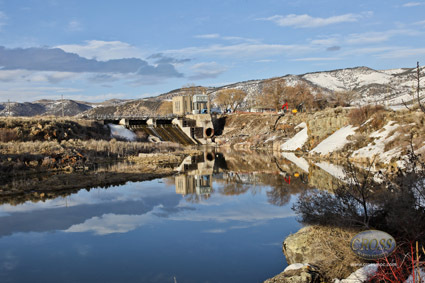 In 2004, Cross Marine performed a retrofit similar to the Grace Dam operation on a dam in Colorado that allowed a simple containment dam to install electrical turbines and generate clean electricity. 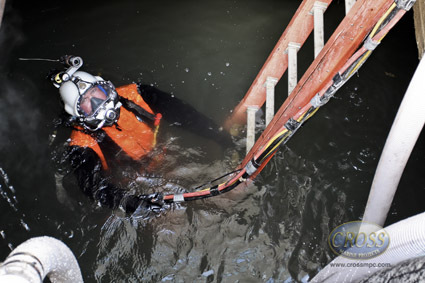 Cross Marine Projects is a global leader in underwater construction and salvage with headquarters in American Fork, Utah. The company specializes in innovative solutions to difficult underwater engineering challenges. 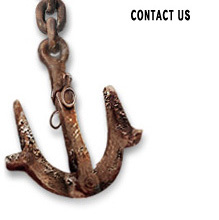 Cross Marine Projects performs work all over the world and is also noted for its many construction, search, and salvage operations under adverse conditions.